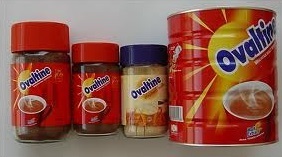 Ovaltine (Ovomaltine) is a brand of milk flavoring product made with malt extract (except the blue packaging in the US), sugar (except in Switzerland), and whey. Some flavors also have cocoa. Ovaltine, a registered trademark of Associated British Foods, is made by Wander AG, a subsidiary of Twinings which acquired the brand from Novartis in 2003, except in the United States, where Nestlé acquired the rights separately from Novartis later on.